Theresa was in town recently, and you know what that means! Dress ups! And photoshoots! 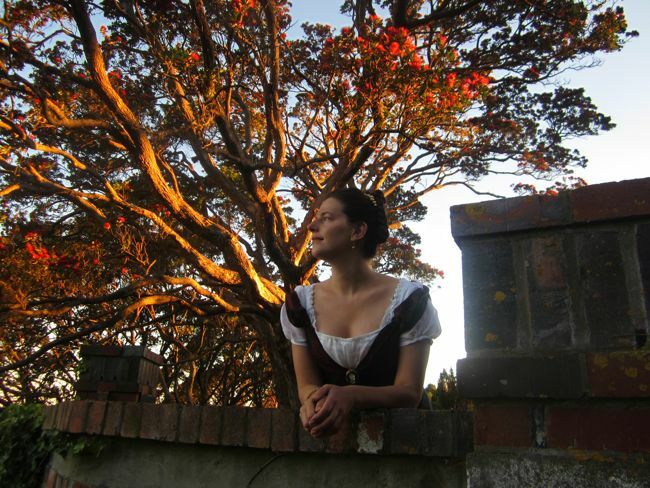 For this photoshoot we wore Regency, because the pohutakawa (the New Zealand christmas tree) were in full bloom, and I think my 1813 Kashmiri gown works beautifully with the blaze of red blooms. Also it was too hot to think of anything that involved full corsets and layers of undergarments. This time we did something a little bit different, and Mr D came along and was our photographer, so (for once) we have lots of gorgeous photos of the two of us together. With two ladies in Regency wandering around a garden it’s impossible not to make Jane Austen themed commentary about the photos. In doing this I’ve realised an unfortunate problem with Austen: other than Lizzie and Jane from Pride & Prejudice, there are no sets of two females that a pair of friends would really be happy to be. Emma is insufferable, her friends silly. Fanny is a prig, her associates terrible. Anne is great but none of the other females in her novel are. I suppose Catherine and Eleanor are OK, but they are so young. And Elinor and Marianne, are, once again, sisters. Also, Marianne? No thanks. 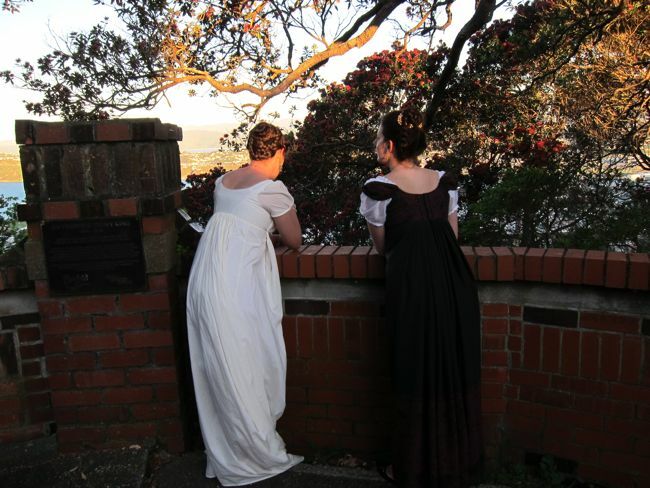 So, sisters or not, we can be Lizzie & Jane for the evening (with the actual allocation of parts left unspecified), enjoying the garden and the exotic pohutakawa trees before heading out for a ball – perhaps at Netherfield? They probably have all that time to spend in the garden because they were ready hours before Kitty found her lost ribbon and Lydia decided what frock to wear. OMG, these photos are glorious! (I haven’t yet managed to look through all the ones you gave me.) The Maxfield Parrish one at the end is my supreme favorite. It’s lovely. No matter who you are. That last picture? That’s just perfection. 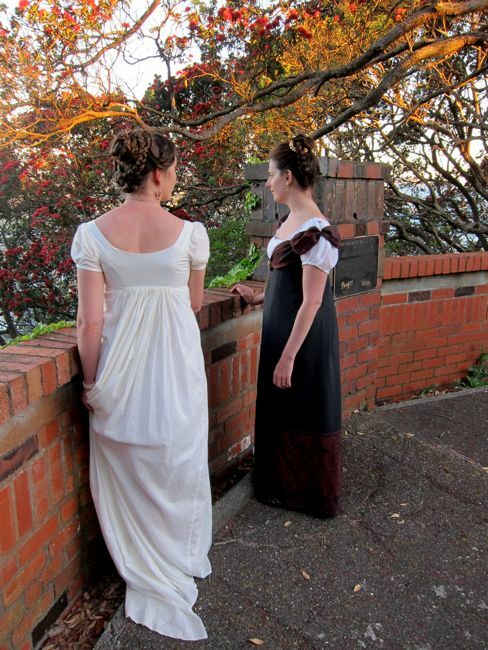 And it’s so nice to see more of your Regency clothes! It’s strange, but true. There really are few good friends in Austen’s books. In fact, I have trouble coming up with examples who are not sisters, in general – the first book that comes to mind is Anne of Green Gables, much later. Not that I’m that well-read in 19th century women’s literature, mind you. Clarissa and…oh, what is her friend’s name? Mid 18th-century, difficult book, written by a guy, so maybe it doesn’t count. You means Clarisse Harlowe and miss Howe maybe ? Ya’ll look great! And I absolutely love that last picture of you! Yay! I got my job teaching college, again. 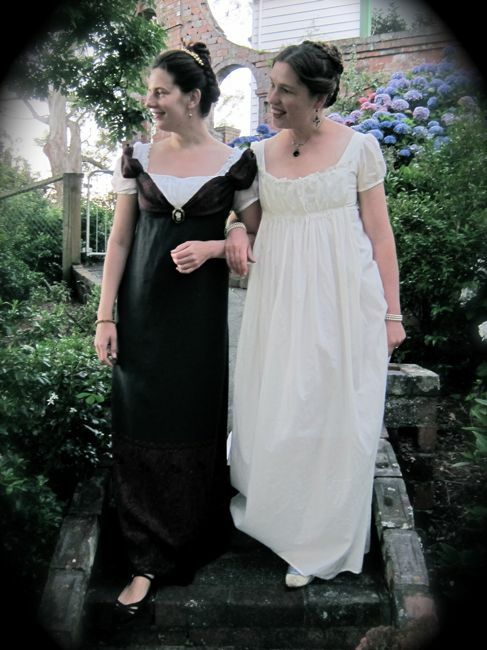 I bring this up because I see so many of Austen’s heroines in my students, and I think that it is so much fun. 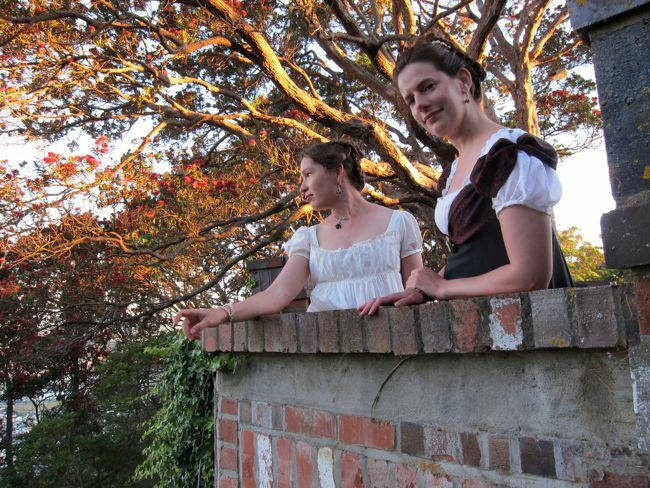 Elinor and Marianne are exactly what two ladies 17 and 19 should be like, as is Emma at 20. What about Anne and the Admiral’s wife? Maybe not equal ages, but respectful, nonetheless. Elinor comes to find much worth in Mrs. Jennings and values her friendship deeply come the end of the book. Funny…you are right, there are few women of equal ages. It must be hard in a small town. You both look lovely, and so period! We are so lucky to live in this age of easy travel and even easier communications. In Austen’s time, your circle of friends was mostly limited to the people who lived within walking distance, and in the country, the choice was narrow. 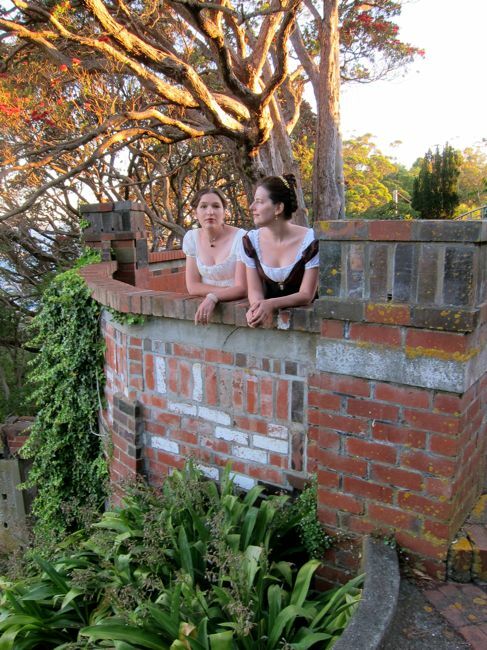 Lizzie and Jane were fortunate – even sisters were not always close friend material. No wonder people wrote letters madly to people they were fond of. You both look beautiful. The light and the setting is perfect, and Mr D. made an excellent job! And, oh, my goodness! My comment just flicked up so quickly, without all the drama of waiting to see if it had timed out or been eaten by cyber-monsters! I rejoice in the reformed page! I liked Elinor, but I adored her youngest sister, Margaret I think? I love that she was a tomboy when it was frowned upon and that she wanted to go to India. I do love your photoshoot, and hope my finished outfit looks as good as yours do; just starting on the stays now. I aspired to be Elinor, but am just as impulsive and emotional as Marianne. Margaret I always found annoying and in the way, which isn’t very generous of me. See? Again, I’ll never be as cool as Elinor. Anne and Mrs Harville? Or even Anne and Mrs Smith? Cathrine Moreland and Mrs Allen? I like the old lady rather much. Miss Tilney I like too. She’s rather friendly and tries to see good in anyone, but is not afraid to see her own elder brother in a bad light. I never understood the hate for Fanny everywhere. Nobody seems to like her. “Boring” is the nicest word I can find. She has her faults, to be sure, like not liking stupid people. She doesn’t like Mary Crawford – and she is right about that! Even IF Mary is nice to her, she wishes death upon a man, so she can marry the brother and still live in style. I’ve known people who were raised to be “grateful” all the time and to feel “less” then the people they grew up with. That is hard. It does things to soul. Today, fashion calls for outgoing and self-confident people, but I like the shy and socially awkward ones too. I always felt bad for Fanny, although Austen’s mother was right to call her ‘insipid.’ But even insipid people deserve a chance at happiness and respect. They remind me of the ‘nice’ girl in school, practically invisible, dependable, often taken for granted. Of course, those are the ones I am the happiest for when I peek back into my old high school friends’ lives on Facebook.